Yesterday (6/2) there were no new turtles admitted. The search boats were unable to go out due to severe weather. We spent the day treating the turtles that have been admitted over the past few days. 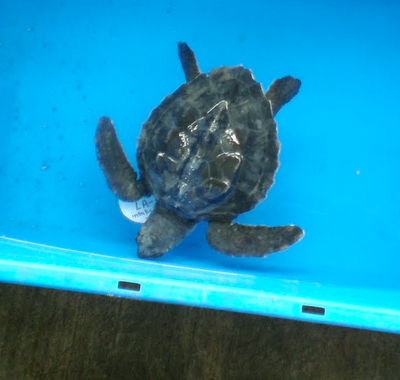 This tiny Kemp's ridley is among the turtles being treated. Read Dr. Innis first report from the Gulf in this previous blog post. Thank you for letting people know what is happening down there. #2 "Head It Off At the Pass?"